Looking to escape the mundane? Try art, suggests Volume Inc.'s new campaign for the Yerba Buena Center for the Arts (YBCA), invading San Francisco streets in July. More of today's contemporary art is inclusive, meant to be embraced by everyone, and Volume Inc. is helping YBCA bring this new message to the people. The energetic and edgy guerrilla campaign--spread across city streets, transportation hubs, and even the sides of buses --operates like street art, where surreal illustrations hijack stock advertising images to deliver the message. The prank sends a clear message: Art is subversive, approachable, even fun. 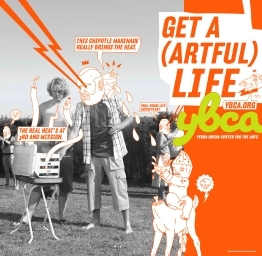 Visit the YBCA and get in on the action. "I am very excited about this new campaign and the way it communicates the essence of YBCA to the general public," said Ken Foster, YBCA Executive Director. "We strive to be both provocative and fun, and through that approach we hope to encourage people to see how contemporary art can also relate to their own lives." The campaign comes alive with vibrant color and an infestation of cheeky character illustrations against the flatness of various black-and-white scenes. Humorous dialogue disrupts the dull routines of daily life: a guy vacuuming, suburbanites barbecuing, kids running through a field. One scenario shows a black-and-white photo of a businessman talking on his cell phone, but don't expect the ad's message to sell a new wireless plan. This generic image has been reappropriated and reengineered. A bright blue cartoon bubble above his head playfully shows his inner thoughts: "I worry that my cell phone is more interesting than I am." Whimsical creatures tell the man to "Set Your Life to Vibrate" and get to YBCA. The promise is the Everyman will escape banality, and get a (artful) life. YBCA to the rescue.